Seedling heat mats, soil heat tape and timers make propagation in mini greenhouse growing systems work! 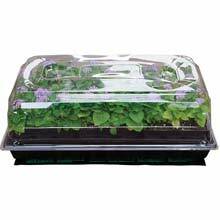 Do you want faster, healthier, fuller seed germination? Then do what the Pro's do! The secret is in the large and small seedling heat mats, timers to optimize energy, heat tape for your cold frames and mini greenhouses. Waterproof, electric mats that warm the root area of your planting soil anywhere from 10-20 over the ambient temperature. 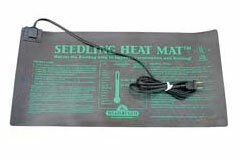 Heat propagating mats and heat tape come in many sizes to fit under one, two. three or more seed flats and cold frames. Thermostats can be used for more accurate heat settings and energy savings. We have a good selection here of what you need. Just 'click' on the links or pictures above to find what you need. When you do find what you need, just select the "add to cart" button, fill out the order form and your greenhouse equipment will be on the way to your door.